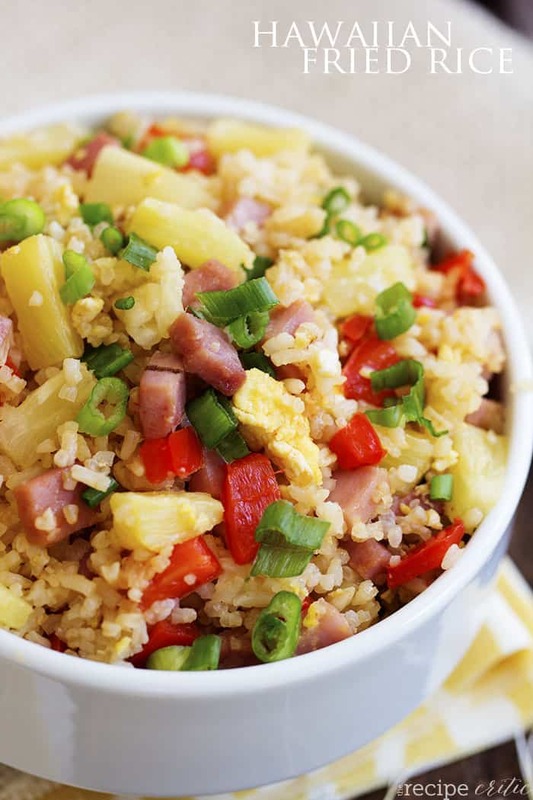 Fried rice that is loaded with sweet pineapple, ham and veggies that is so much better than take out! We made the mistake of actually ordering chinese take out last week. I was just too tired to make anything and craving chinese. That was a huge mistake. Every time I give in to ordering take out I wish I would have made my ‘better than takeout’ recipes at home. I promise that this Hawaiian Fried Rice is better than takeout. It started with this sweet and sour chicken recipe on the blog. I didn’t believe it was possible to make something at home that was better than takeout. But it is. And that recipe is my favorite recipe on the blog. It will make you regret ever ordering takeout. Everything is awesome about it from the breading around the chicken to the sauce. It is possible to make better than takeout at home! So naturally you have to have a Better than Takeout fried rice recipe to go with it right? Well I have made plenty of variations on the blog. And they all get rave reviews. 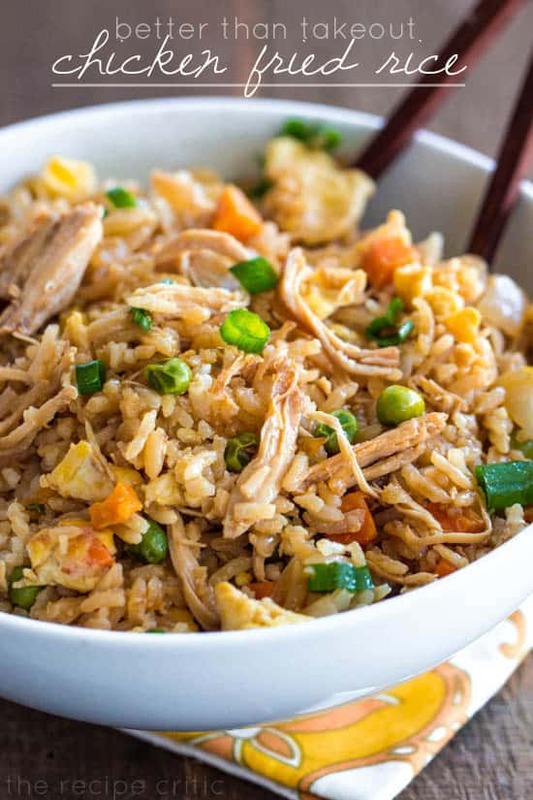 But this version of the Better than Takeout Fried rice series might have just become my favorite! This is loaded with so many amazing things. 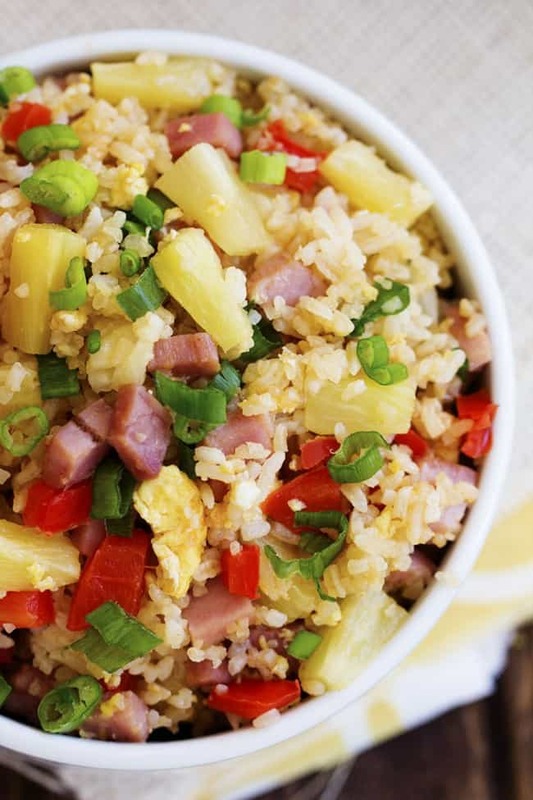 And the Hawaiian Ham and Pineapple combination is awesome! I love how the pineapple adds a sweet taste with every bite. It balances out all of the flavors. And oh my heavens. It is incredible. I couldn’t even wait to eat this and may or may not have been eating it by the spoonfuls while it was getting photographed. I love making it because I am reminded how incredible it is! Ditch the takeout tonight and make this for your family! They will love it! Preheat a large skillet or wok to medium heat. Pour vegetable oil in the bottom. Add chopped ham, white onion, and red bell pepper and fry until tender. Slide the ham onion, and red bell pepper to the side, and pour the beaten eggs onto the other side. Using a spatula, scramble the eggs. Once cooked, mix the eggs with the vegetable mix. 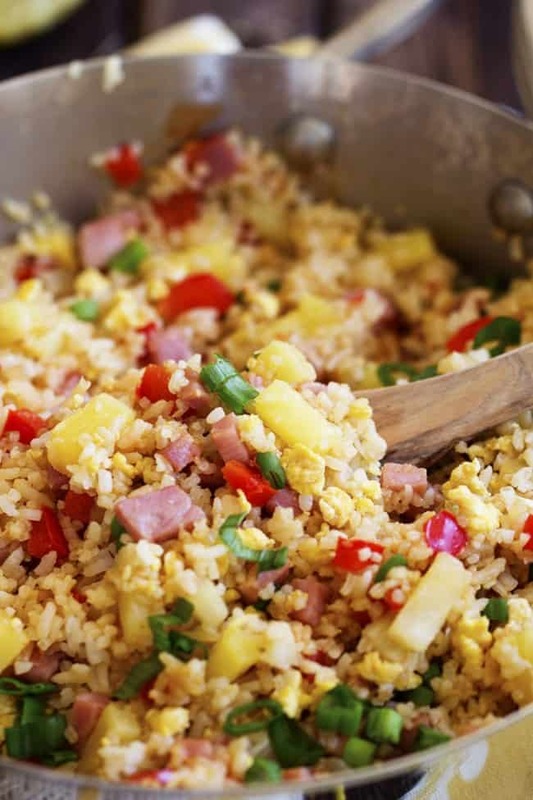 Add the rice and pineapple to the veggie, ham and egg mixture. Pour the soy sauce and sesame oil on top. Stir and fry the rice and veggie mixture until heated through and combined. Add chopped green onions if desired. Love Fried Rice like I do? Yum, this looks delicious! I hate ordering take out because it is so expensive- I can make three meals for the price of one takeout order!! Oh my goodness my youngest son is going to LOVE this! He loves fried rice but I don’t like how salty it is and wonder what weird things are in it. I also love when I already have the ingredients on hand so much more fun than running to the store for things. This looks amazing!! What type of rice do you recommend?? 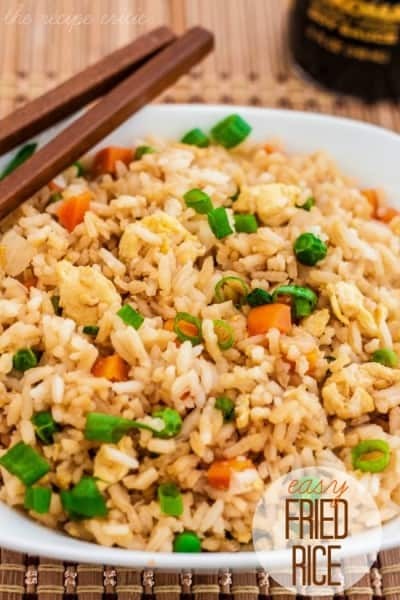 Thanks for sharing your wonderful fried rice recipe. I can’t wait to try it, and I’m pretty sure my kids will love it. Hi! Made this today and it was really yummy and easy to make! 4 out of 5 of my kids liked it (the one doesn’t like pineapple to begin with, lol) so I consider this a big win in my household! This was another A+. I was surprised at how good it was for being so simple. do you figure the 6-8 servings as a main dish? I’m thinking this would be a great side for a Hawaiian themed dinner, but am getting kind of stuck on quantity. It sounds delist, can’t wait to try it! can you please give me instructions on how to cook the rice?? i would love to make this for my moms Hawaiian birthday party. This was great HOWEVER I made the rice ahead of time but that was not a smart move. The rice did NOT turn into “fried” rice. The dish itself was awesome! The rice has to be 1 day old cold from the fridge. I found this recipe last week to use up leftover ham and have made it twice now. My husband is obsessed with this recipe! I added extra veggies (peas, carrots and cabbage) to make it a complete meal. Thanks for the great idea! Any suggestions for a substitute to pineapple? My boyfriend is allergic and I’m worried about it missing the sweet component with nothing there! 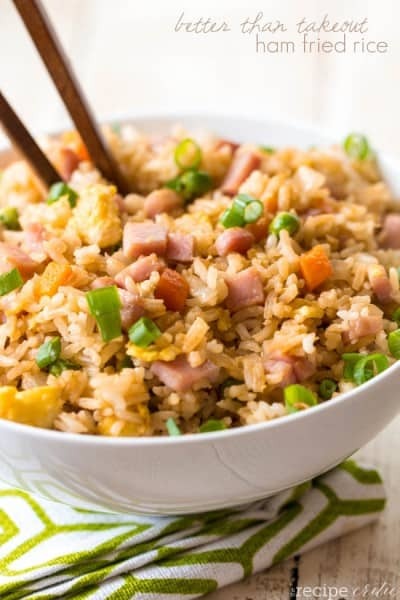 Made this with leftover Easter ham and it was very good, but my ricee tuned brown from the soy sauce any suggestions. Made this with cauliflower rice and leftover Easter Ham! Hi Alyssa- This looks like a tasty dish ! Just wondering if you have a nutrition count on it ??? Do you have your recipe URL to get the nutritional information in MyFitnessPal? Will this last several days in the fridge ? I’d like to try it as a lunch meal and portion to each some over the course of a week. Or should I add pineapple and wet ingredients individually each day? This was delicious. It’s going into regular rotation. Thanks for posting.